Ramabai Ranade (25 January 1863 – 1924) was an Indian social worker and one of the first women’s rights activists in the 19th century. She was born in Kurlekar family in 1863. At the age of 11, she was married to Justice Mahadev Govind Ranade, who was a distinguished Indian scholar and social reformer. In that era of social inequality, women were not allowed to go to school and become literate, Ramabai, soon after her marriage, started to learn reading and writing with strong support and encouragement from Mahadev Govind Ranade. Starting with her native language Marathi, Ramabai strove hard to master English and Bengali. Inspired by her husband, Ramabai started ‘Hindu Ladies Social Club’ in Mumbai to develop public speaking among women. 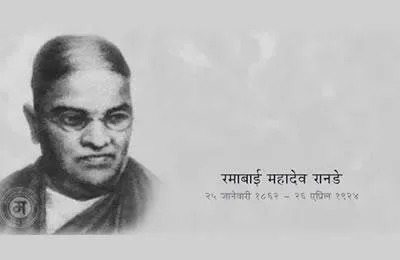 Ramabai was also a founder and President of ‘Seva Sadan Society’ in Pune. Ramabai devoted her life to the improvement of women’s lives. Ramabai Ranade with her husband and other colleagues established in 1886 the first girls’ high school in Pune, the renowned Huzurpaga.